USHR is reporting that former Terrier captain Brian McConnell has been hired as an assistant coach on Jamie Rice’s staff at Babson College. McConnell, who led the 2004-05 team, has since played two seasons in the ECHL, at Fresno and at Trenton where he teamed with Mike Pandolfo, Gregg Johnson and other former BU players. Terrier fans will recall McConnell's "hattrick" of a goal, assist, and highlight-reel open ice hit on BC's Chris Collins in the 2003 Beanpot Championship game, won by BU, 3-2. And, speaking of the Beanpot, a news feature, originally on Si.com, lists the "101 Things a Fan Must Experience Before They Die." The Beanpot is number 72, just a few slots down from the U.S. Pond Hockey Championships. When first published, the article had Beanpot written as two words and being played in December. Alert fans prompted the corrections. Several of the post-draft interview reveal that incoming freshmen defensemen Kevin Shattenkirk and Colby Cohen not only will be teammates at BU and potential pro teammates in Colorado, but they already have a considerable history together on ice, even before being members of the 2005-06 NTDP U17s. 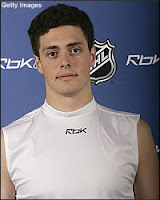 In an NHL.com feature, Cohen explained "Rooming together, playing together, friends since we were 10. This summer, we head there [BU] July 1 and we're going to be staying together this summer." He also explained that he grew up a Flyers fan, but he's an Avs fan now. "If there was one team in the NHL I could have picked to play for it's the Colorado Avalanche," he said. "I have a lot of family out there and growing up I really liked the Avalanche. Joe Sakic is one of my favorite players." Shattenkirk and Cohen also were teammates in 2004 and 2005 on the '89 East Coast Selects, coached by Travis Howe, Gordie's grandson. ECS is one of the top summer/spring tournament programs, competing in events such as the Prospects Tournament in Toronto and the Mission Cup. The '89 club was an exceptional one that included three other 2007 first rounders, Sam Gagner, Logan Couture and Nick Petrecki, as well as future college players Michael Biega (Harvard), Ryan Smith (BC), Ben Rosen (Brown) and Jack Downing (Vermont). Two other future Terriers, Corey Trivino (2008) and Ethan Werek (2009) have also suited up for ECS. "I'm an American kid and I've always liked the idea of college," said Colby Cohen, who's headed to Boston University after being selected in the second round by Colorado. "My mom went to Boston [University], so it's just the perfect fit. I'm going to head there with the Avalanche first-round pick Kevin Shattenkirk. We're rooming together, playing together." A USCHO feature, "Meet the Press," included more thoughts from Cohen on where he'll call home in the near-term and later. One of the most interesting aspects of the Draft weekend is the way in which these very young players deal with enormous media pressure. Cohen, a Philadelphia native, didn't disappoint, displaying an aptitude for handling tough questions from the press, displaying a sincerity and poise admirable for his young age. He gushed about his immediate destination, but knew how to balance his answer. "I really like the [BU] coaching staff, the facilities were great, it's four hours from home. "Boston's the best city in the world — well, it's right there with Denver." Cohen talked with PhillyBurbs.com about coming from Philadelphia, a non-traditional hockey market that now is producing NHL prospects. He also particiapted in a pre-draft Q&A with the Journal Star in Lincoln, Nebraska, where he spent last season as the USHL's top-scoring defenseman. "He wasn’t the top player on our list, but he was very high on our list,” said Avalanche chief scout Ted Hampson. “We saw several players we had behind Kevin go to other teams, and he became No. 1 on our list by five or six selections. [Avs GM] Giguere began the task Friday by selecting Kevin Shattenkirk, with the 14th overall pick on the draft. The Boston University-bound defensemen earned raves for his offensive style and leadership skills while the captain of the U.S. Under-18 hockey team at the World Under-18 championship this past April in Finland. "Our scouts came back raving about him when they came back from the world championships" Giguere said. "Just like me .. I came back raving about this guy." "In terms of offensive upside and ability to change the game and be a big influence offensively, Kevin Shattenkirk, with his vision, is probably the cream of the crop " U.S. [NTDP U18] coach Ron Rolston said. "He was the acknowledged leader both on the ice and in the dressing room for that U.S. Under-18 team” [Red Line Report's Kyle] Woodlief said. “He’s another kid who is not the biggest in the world, but he has excellent power-play skills with really good passing and vision. He tends to come up clutch in huge moments late in close games. So, that all plays to his advantage. The U.S. team actually used him as one of their shooters in all their shootouts and they were involved in a lot of shootouts. So, it was unusual that he was their go-to guy, even in shootouts." 2007 recruit Nick Bonino and 2008 recruit Andrew Glass were selected in the 6th and 7th round respectively. Bonino, the scoring leader at New England Prep champ Avon Old Farms, was taken by San Jose. Glass, who returns to Salisbury for his senior season, was chosen by the Washington Capitals. Shattenkirk and Cohen fly a mile high! With several presidential candidates choosing campaign theme songs, selecting a tune for the incoming BU freshman class now is a no-brainer. It just has to be John Denver’s “Rocky Mountain High,” now that the Colorado Avalanche has followed up its first round choice of Kevin Shattenkirk by selecting Colby Cohen with the team’s first of three second rounders, #45 overall. More on Cohen's selection later today. In announcing the club’s selection of Shattenkirk, Avs Chief Scout Ted Hampson told the Denver Post, “We're real high on his skill level and his hockey sense. He always seems to do the right things with the puck and without the puck. We had to wait and watch several players that we had behind him get taken by other teams, so we were excited to see him there." Additional coverage of the choice is on the Avs Web site and in the Rocky Mountain News . Boston University-bound Kevin Shattenkirk of Greenwich, Conn., was drafted by the Colorado Avalanche with the 14th overall pick. The defenseman will have the opportunity to make an impact on the Terriers right away, since three of their regular defensemen last season graduated. The coaching staff and city drew Shattenkirk to Boston University. "I love the coaches there. I worked with David Quinn in the recruiting process and he was just a great guy and has a lot of knowledge of the game. Obviously coach (Jack) Parker is a famous coach and you can't really go wrong there. I love the city of Boston and felt in the end that it was the best fit," Shattenkirk said. The Rockies have compared Shattenkirk to their standout puck-moving defenseman John-Michael Liles, who also was an NTDP standout prior to his college career at Michigan State and are hoping Shattenkirk’s development will emulate Liles’. That path would be more than okay for Terrier coaches and fans. Liles became Michigan State’s all-time top goalie-scoring defenseman, a two-time All-American and a Hobey Baker finalist in his four seasons as a Spartan. Like Shattenkirk, Liles grew up a fan of New York Rangers star Brian Leetch. Longtime Terrier fans will have spotted two former Terriers making stage appearances during the first-round proceedings. When Patrick Kane (sigh) posed in his Blackhawk jersey, one of the Chicago officials with him with scout Ron Anderson, a high-scoring winger on BU’s 1971 and 1972 NCAA championship teams and a former head coach at Merrimack. Anderson’s assistant coach on those Terrier title teams, Bob Crocker, now a Los Angeles Kings amateur scout, was part of the Kings entourage that took the stage to select Thomas Hickey with the 4th overall choice. Crocker is the dean of New England NHL scouts. In a recent McKeen’s Q&A interview, Shattenkirk was asked to name the top five skaters he’d played with or against. Four of the five—Patrick Kane, James Van Riemsdyk, Alexi Cherepanov and Angelo Esposito—also were first round choices in the draft, with Kane and Van Riemsdyk going first and second overall. The fifth player, Shattenkirk’s NTDP teammate and fellow BU 2007 recruit, Colin Wilson, will be eligible for next year’s draft. By being selected 14th overall, Shattenkirk is the 7th Terrier to be selected in the first round of the NHL draft, 14th overall, just behind his new blueline mentor David Quinn, who was picked 13th in 1984 by the Minnesota Stars. USA Hockey has prepared a listing all previous American born players chosen in the first and second rounds of the draft, including former Terriers Quinn, Scott Young, Keith Tkacuk Mike Pomichter, Jay Pandolf, Jeff Kealty, Rick DiPietro, Ryan Whitney, Mike Pomichter, Jay Pandolfo, and now Shattenkirk and Cohen. San Jose made some draft day trades to open up cap room for a reported effort to sign free agent Chris Drury. If the former Hobey Baker Award winner does head to the left coast, he’d once again be reunited with Mike Grier, his teammate at BU and with the Sabres. With the first round of the 2007 NH Entry Draft just a few hours away, we present some Terrier Draft Day morsels. Bonino, a senior at Avon Old Farms in Connecticut (the same boarding school program once attended by Brian Leetch and Chris Higgins, among others), was born on April 20, 1988. Compared by his coach John Gardner to Chicago Blackhawks center Jeff Hamilton, Bonino has been a dominant player at the prep school level, posting 26 goals and 56 points in 25 games this season. Prior to that, he scored 68 goals for Farmington High School in Connecticut. He is committed to playing NCAA hockey for Boston University in the fall. The main issue that has held back Bonino: skating. He lacks an explosive first stride and won’t win many footraces with NHL caliber players. But several NHL scouts have said that if the player improves skating ability (for example, through intensive power-skating training), he has the hands and creativity to be a productive professional player. “Look at Doug Weight. He never dazzled anyone with his skating but he compensated other ways. I’m not saying (Bonino) is going to have a career like Dougie’s, but he has the type of hands and creativity where you can take him and hope his skating catches up. Everything else is there,” says an Eastern conference scout. The official NHL online draft center is located at here , while CSTV.com’s is at this link, where a Dave Starman feature points out that BU, with 51, is third among all colleges in draft choices, trailing only Minnesota and Michigan. Hockeysfuture.com has tallied up the list of college affiliated players in the Central Scouting rankings of North American skaters and goalies. Among the skaters, there are four BU recruits--Kevin Shattenkirk, Colby Cohen, Andrew Glass (2008) and Bonino—in the top 26 ranked. Kieran Millan (2008) is 6th among goalies entering or committed to an NCAA school. Shattenkirk, who has been slotted anywhere from 8th to well into the second round in the myriad of mock drafts found on the Internet, including a projected 12th by Montreal in the RedLineReport mock draft, is profiled by his hometown Westchester, N.Y., newspaper, The Journal News. TSN.com’s top 60 ranks Shattenkirk and Cohen at 12th and 36th respectively. The Boston Globe and Boston Herald each provided pre-draft coverage today. And, in a draft-related trade, because his team needed to shed salary, ex Terrier Adrian Aucoin was traded by the Blackhawks to the Flames where he’ll rejoin Mike Keenan, who coached him in Vancouver where he scored 23 goals in 1998-1999. Aucoin struggled in Chicago after several standout season with the New York Islanders. Finally, the Terrier Hockey Fan Blog has lined up an on-site correspondent for the draft. We hope to have a report over the weekend, but will keep you posted on the draft using a variety of online sources. USHL rivalry moves to Comm. Ave.
Another gem from CSTV.com’s Elliott Olshansky, who surveys the USHL rivalry between defensemen Colby Cohen (BU) and Nick Petrecki (BC), which will continue next season when the highly ranked draft eligibles suit up at opposite ends of Commonwealth Avenue. The article features an embedded video link to a Lincoln-Omaha game last season when the two blueliners—both All-USHL second-team honorees, dropped their gloves and Cohen dropped his larger opponent. From NHL Central Scouting: An offensive defenseman with good puck skills. Reads the play well and is heady in transition. Has good mobility along with quick feet. Needs to add a physical presence to his game. Needs to improve consistency of his defensive game. From ISS: Kevin is a confident d-man, very good team player. He reads the play well. He potted very nice and important overtime goal with accurate wrist shot against Sweden. Tries to shoot from every position and keep it very low. Still needs more power to his legs and muscle mass. Good puck-handling ability. Displays leadership qualities. From NHL Central Scouting: A skilled offensive defenseman. Has good puck skills and a good shot from the point. Makes good passes and sees the ice well. Needs to improve his defensive positioning and the consistency of his work ethic. Led all USHL defensemen in points. From ISS: Right-shooting d-man beings a lot of offence to the table. Cohen joined Lincoln six games into the season after leaving the National Team Development Program and quickly has made up for lost time. He's got a very good shot, especially his one-timer. Improving defensively will be the biggest factor in Cohen's advancement in hockey. A New York Ranger fan blog profiles Cohen as a potential Blueshirt draft choice. This draft guide lists Shattenkirk at #13 and Cohen at #14 and includes profiles of each. And finally, OnFrozenBlog takes a humorous look at the replies to a question that NHL Central Scouting asked of some 200 potential draftees: What three people would you most like to have dinner with? Last Monday was the annual Terrier Hockey Golf fundraiser. It was held at Tedesco Country Club in Marblehead and featured a mix of former Terrier players, alumni, and Friends of Hockey along with other sponsors of the program. As a non golfer I generally go for the dinner and a chance to see some former teammates and other ex players whom I have come to know through the informal BU Hockey Alumni network. It was a nice day for golf and it appears that all of the participants enjoyed themselves. Coach Jack Parker (a non golfer as well) tends to mingle amongst the groups sharing stories and catching up in a nice relaxed setting. Celebrity Marketing, headed by ex Terrier Cleon Daskalakis has hosted the event for the last several years. Some of the former Terriers in attendance were, Cleon, Coach Parker, Coach David Quinn, Coach Mike Bavis, David Sacco, Tom Dion, Mark Krys, Mike Eruzione, Bobby Richardson, Tom Ryan, Mike Sullivan, Dan Cavanaugh, Paul Miller, Chris Dyment, Pat Aufiero, Chris Mays, Tim Kimball, Bill Whelton, Gary Fay, Marc Hetnik, Brian Collins, Vic Stanfield Tony Ruvolo, Brian Durocher, and I am sure others that I missed (as I age my recall without notes isn't the greatest). Chris Dyment is getting married (this weekend I think) and will return to hockey, Dan Cavanaugh has finished his 6th year of pro hockey and played this past season for Springfield in the Lightning organization coached by former Terrier Captain Steve Stirling, and Pat Aufiero will begin law school this fall at Suffolk University. Mike Sullivan is happy to be back in the NHL where he will be an assistant at Tampa Bay and will soon head south to look for home, school etc. All of the coaches are enthusiastic about the incoming class of recruits, many of whichyou have read about in this blog. All in all it is a nice midpoint to the end of last season and the beginning of the next one. CSTV’s Rink Rat, Elliott Olshansky has been a busy writer with three excellent articles just this week. The first relates to Wednesday’s post about John Curry and the report in the Globe Bruins’ Blog that Jack Parker has been contacting NHL coaches on behalf of the All-American goalie who is a free agent. The RinkRat post addresses the relationship between college coaches and NHL general managers as it impacts the decision as to whether an undergraduate skater might be ready to join the play-for-pay ranks. In the article, Parker says he more comfortable talking with GMs and player personnel managers he already knew from college such as Jack Ferreira, Brian Burke, Paul Fenton and Lou Lamoriello . Thursday Elliott chimed in on the NCAA vs. Major Junior debate over the best place to develop, and on Wednesay, he examined which NHL teams historically have drafted most heavily from the college ranks. If you thought All-American goalie John Curry was a bit off his game in BU’s last few games this past season, you’re right and the reason is that he played with a torn labrum in his hip. Fluto Shinzawa reveals the injury in a June 13 post to the Boston Globe's Bruins’ blog. The quote also quotes Jack Parker saying Curry should have an NHL contract very soon. Incoming freshman Colby Cohen, ranked 25th among North Americans by Central Scouting was the subject of a feature in the Philadelphia Inquirer. Cohen who displayed a blazing shot from the point in his Central Scouting video clip, was the top-scoring defenseman in the USHL last season with 60 points. Thanks to the Vancouver Canucks Web site, we have the opportunity to view Central Scouting video of 100 top-ranked draft eligibles, including three incoming freshmen. Colby Cohen is #25, Kevin Shattenkirk #34 and Nick Bonino #89. The Shattenkirk video is the same in the link posted here on June 6. Cohen, a right-shot defenseman, shown playing the left side, displays the blazing shot that made him the USHL’s top-scoring defenseman in more than five seasons. The Bonino clip shows exactly what one talent evaluator says about him: “First round draft choice hands, but his wheels will make him a third rounder.” If Mike Boyle can improve his skating, BU has quite a weapon. Two current Terriers and two incoming freshmen are among the 45 skaters invited to Lake Placid for the 2007 National Junior Evaluation Camp in August. Rising sophomores Brian Strait and Luke Popko and new recruits Kevin Shattenkirk and Colin Wilson will compete for spots on the U.S. squad that will travel to the Czech Republic in December for the IIHF World Junior Championships. Goalie Brett Bennett had attended a pre-camp goalie evaluation last month, but was not invited to Lake Placid. Even so, BU’s representation at the camp will total five because the Junior National Team coach is John Hynes, also coach of the 2007-2008 NTDP U18s. USA Hockey has introduced version 2.0 of its Web site. It is a visual improvement, but still under construction and the archive portion of the site is not yet available. There was more good news for Shattenkirk. Kevin Paul Dupont reported in The Globe’s Bruins Blog he was among five draft prospects invited to Boston for a battery of tests and interviews. College Hockey and the University of Massachusetts-Lowell, in particular, dodged a bullet with the City of Lowell and the University reached a compromise on the fees for playing home games at Tsongas Arena. The one-year deal keeps the River Hawks program afloat for at least one more season. The Lowell Sun reported that "the one-year deal, would eliminate the university's annual $50,000 contribution to the arena, give UMass Lowell a bigger piece of food and beverage sales during its 17 home hockey games..." Tsongas Arena, which also is home to the AHL Lowell Devils, has a capacity of 6,496. Last season, the River Hawks, coached by former BU associate head coach Blaise MacDonald, averaged just under 3,000 in home game attendance. Last weekend BU incoming freshmen Kevin Shattenkirk and Colby Cohen joined more than 100 other draft eligibles at the 2007 NHL Combine in Toronto for rigorous workouts and interviews with NHL scouting staffs. A report that this blogger received today indicates both Terrier recruits impressed at the Combine and could be taken in the first round. The Bruins, who have the eighth overall pick, took a hard look at Shattenkirk, who was the subject of an NHL.com feature story just prior to the Combine. Included is a link to a 5-minute video of Shattenkirk in action for the NTDP U18s—notice his ability to fire one-timers—and a personal profile, complete with that “three people you'd like to dine with” question. Kevin’s choices: Achilles, Einstein and Michael Jordan. Former Terrier center Dan Cavanaugh was the keynote speaker at last month’s McDonalds’ McScholar Athlete Awards event recognizing winners from Western Massachusetts. Cavanaugh, who spoke about the need to persevere to reach goals, played three seasons at BU, with a career-high 34 points in 1999-2000. In 2006-07, he spent his sixth pro season with the AHL Springfield Falcons, coached by former BU All-American and New York Islanders coach Steve Stirling. The UMass-Lowell hockey program in serious danger and may be extinct before the month is out. A USCHO feature article references a Lowell Sun report that “ the city of Lowell and the University have until June 21 to restructure the lease deal at the Tsongas Arena or the UMass Board of Trustees will vote to terminate the hockey program which has been a member of Hockey East since the league's inception in 1985.” If this worst case scenario pans out, each of the other nine Hockey East teams will find itself with three holes in its 2007-8 schedule and more than two dozen players will be scrambling to find a school that will accept them for next season. The Northwestern women’s lacrosse team’s march to a third consecutive NCAA championship this year included a win over BU’s standout squad. There’s also a connection between the Wildcats and BU hockey. Coach Kelly Amonte Hiller is the younger sister of Tony Amonte, a scoring star for two Frozen Four Terrier squads. Amonte Hiller, a two-time D-1 Lacrosse Player of the Year at Maryland, resurrected a Northwestern program that was disbanded in 1993 and recalled to life in 2000. With last night's Duck's win over the Senators, ex-Terrier Joe DiPenta is on the verge of becoming the sixth former BU player to have his name inscribed on Lord Stanley's Cup. 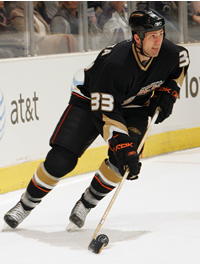 DiPenta had sat out the first three games of the final series, but returned to the lineup when Chris Pronger was suspended for one game. The other Cup winners are: Jay Pandolfo, NJ 2003 and 2000; Scott Young, Colorado 1996, Pittsburgh, 1991; Chris Drury, Colorado 2001, Shawn McEachern, Pittsburgh, 1992; and, Ed Ronan, Montreal, 1993. Mentioning Ronan always reminds me of the last time he was in the playoffs. A late season call-up to the Sabres in 1996-97 after spending most of the season in the AHL, Ronan scored a game-winning playoff goal in overtime. After the game a reporter thrust a mic in his face and asked how excited he was to score the game-winner, and Ronan, six years removed from his college career, replied, "I can't wait to call Coach Parker and tell him."